Remember all that kvetching about pie-making? Well, umm, yeah. It all worked out okay. 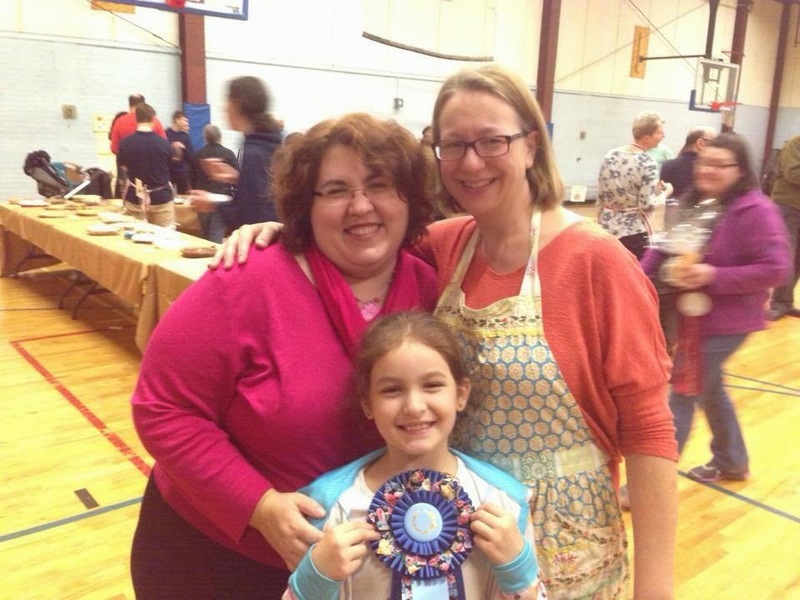 That's a picture of me with the creator of the South Side Pie Challenge, Julie, and my kiddo. In the child's hands is my blue ribbon for the cream pie division. I feel incredibly lucky. I really, truly, was not sure the pie would even work, and with no test pie made beforehand, I had every reason to believe a crash and burn were in my future. I also feel very pleased that all these years of cooking and baking have amounted to enough practice to pull something like this off, even if it required a healthy dollop of beginner's luck, too. I'm most thrilled, however, that the event—an event that was really a representation of Hyde Park (and Chicago!) at its best—raised over $2,500 for local hunger programs. The pie will only be made again if my trial and error technique can be winnowed down into a simpler, streamlined version, which I think I can do. I'll post my recipe if I can make it into something that does not make bakers go cuckoo preparing it. Thanks for all the support, friends!